Small groups are the place where relationships with one another really develop as you continue your spirtual walk. Groups meet throughout the week utilizing a vareity of studies. Check the church calendar for the current groups. On Wednesday nights, Pastor Dave, Bob Crisenbery, and Pastor Bob Waggoner take the time to visit those who have recently started attending Livng Hope, who are going through a struggle, or who are ill. If you would like a visit, or would like the Pastors to visit someone in the hospital, please contact Pastor Dave or call the church. The Men's Breakfast is the first Saturday of every month, and is currently at the Union Street Grille in Bryan, Oh. Men from Living Hope and other area churches get together to enjoy breakfast and hear a speaker. Under the direction of missions coordinator, Kyle Clark, we have a community garden located on one of West Unity's plots on South Madison Street. Anyone interested is welcome to help tend to the garden and then enjoy the produce as it ripens. 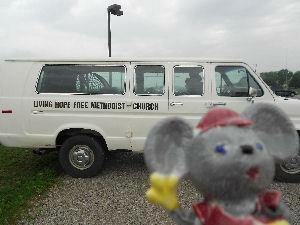 Living Hope has a van that runs on Sunday mornings before Sunday School and during the school year on Wednesday nights before youth groups. We will pick up anyone in West Unity who needs a ride to church - just contact the church.